You may be familiar with indoor labyrinths, like those at St. Mark’s in Seattle and Grace Cathedral in San Francisco, both of which are magical by candlelight. Perhaps the most famous example is at Chartres in northern France, where in medieval times the clergy were said to dance at Eastertime. It is only recently that this ancient pre-Christian symbol was rediscovered by churches as a spiritual tool. Until the early 20th century, fishing folk would walk the labyrinths before putting to sea to ensure good catches and bring favourable winds – unwelcome weather would become trapped in the circuitous coils of the labyrinth . . . the Lapp hunters and shepherds would walk the labyrinths to protect themselves from wolves and wolverines and to entrap the trolls and other evil spirits, who would follow them in, but would be unable to find their own way out . . . from the centre of the labyrinth. However, in his fascinating essay, Olsen theorizes that the labyrinth served a much deeper purpose: it was a physical metaphor of the spiritual transition from life into death. Noaidi may have used the path during burial rituals, and the Sámi people may have considered the labyrinth a potent counter-symbols to the church during an intense and often painful period of Christianization. The surrounding Scandinavian and Russian societies were competing over the resources in the Saami area, and tried to gain political control over it. This rapidly increasing contact with the outside world clearly represented a serious threat to basic social and cultural values in the Saami hunting societies, and it is likely to have generated a considerable stress within them. In such a context one might expect that the local societies mobilised a counter-active symbolic and ritual production in an attempt to reinforce key cultural values, and to communicate internal solidarity. Of course my “meaningful place” was special to people long before there was a stone labyrinth (installed by the local parishioners), long before there was a church, or a cemetery, or any residents at all. While they did not establish villages on the island, the local Samish tribe came by canoe from the mainland to hunt, fish, and forage, and—no doubt—to look out at the beautiful views and contemplate their lives and their loved ones. Do their descendants now visit the labyrinth? Do they attend the church? Do they consider one to be a “counter-symbol” of the other? I don’t know. But I’ll have a lot to think about the next time I visit. 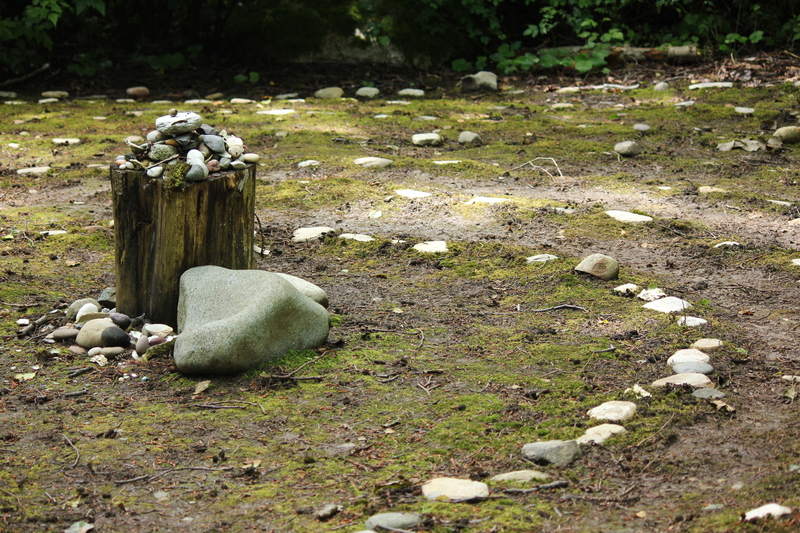 You can find a labyrinth near you with this World-Wide Labyrinth Locator. Let me know what you discover! This entry was posted in History, Personal Narratives and tagged Caerdroia, Kola Peninsula, labyrinth, norway, Sami by Julie Whitehorn. Bookmark the permalink. Thank you for sharing this. Have you ever walked a snow labyrinth? We have one every year at WWC here in the Upper Mississippi Valley. No I haven’t seen one, Donald, but a snow labyrinth sounds wonderful. How high are the walls? How big is the one at WWC? I am visiting the Oregon Coast soon and wondering if I can make a labyrinth on the beach . . .
Bures, as requested, Julie. But seriously, I thought there was some substantial literature on the labyrinth topic in the ancient Chinese records. I really know nothing re the Sino-Asian civilizations, but encountered references to that in some 19th century French literature seminars, for which the papers and notes have been lost to flood and the frictions of time. Xavi, I found reference to ancient Chinese labyrinths made of incense in a square pattern. The incense marked time; when it burned away it was time to move on to the next part of the ritual. There is also evidence of labyrinths among the Zulu in Africa, and the Hopi in North America. While our explorations of heritage naturally focus on what is unique about a culture, isn’t it fascinating to consider all the universals? Awesome to have such a an ancient and universally sacred space as a labyrinth that holds special meaning for you! Especially as even from the time of the Minoans it was a place held by the goddess and used in agricultural rites, a place honoring the cycle of life and death and transformation. The Scandinavian labyrinths may only be a few centuries old but in my mind they held the same spirit. And yes, the ancient myths tell of the center of the labyrinth being the prison of the Minotaur, so it would seem that our ancestors would likely have wanted to dump all kinds of monsters and useless baggage there before heading out to seek the bounty and blessings of our Mother the Sea.